There is so much good music out there; it can be difficult to familiarize yourself with all of it. Sometimes it takes riding in a friend’s car or mindlessly listening to Pandora to have something catch your ear. In today’s case, Jeep has been playing ads featuring today’s artist which is exposing a new generation to some pretty solid tunes. Steven Georgiou was born in London on July 21 of 1948. The youngest of three kids to a Greek family, his parents owned a restaurant called the Moulin Rouge just a short walk from London’s theatre district. Even though his parents divorced when he was eight years old, they continued to run the restaurant and live above it. Attending Catholic primary school, Steven found a love for the piano and taught himself as no one else in the family could play. After getting swept up by Beatlemania, he also started to learn guitar around age 15. He’d often sit on the roof strumming his guitar and writing new material while listening to the musicals coming from just around the corner. He would begin to perform in 1965 under the stage name Steve Adams. He attempted to form a band, but found he preferred being a solo act. When the music business was a certainty, he changed his name again to Cat Stevens–in part because a girlfriend said he had eyes like a cat, but mainly he said, “I couldn’t imagine anyone going to the record store and asking for that Steven Demetre Georgiou album”. In spite of contacting tuberculosis in 1969 and being close to death, Cat trudged on and would begin to achieve major popularity in the early to mid-‘70s. The illness gave him a new perspective that allowed him to change labels and management, and make music he enjoyed making. Today I’m listening to his fifth studio album, Teaser And The Firecat which was released October 1, 1971. An immediate success, the album reached #2 on the charts and was certified gold within three weeks. To date, it has sold more than three million copies in the U.S., making it his most popular album here. Critics praised his musical style and introspective writing, calling it his most musically entertaining album to date. It was such a hit, he even wrote a children’s book based on the characters from the album cover. In 1977, an animated version of the book was released as well, also to popular acclaim. Mr. Stevens is one of those guys that you’ve heard at least a handful of his tracks in your life, but may not know it. After Jeep recently used his “If You Want To Sing Out, Sing Out” track, the plays for him on Spotify went up almost three-fold. It excites me a new generation of music fans are being shown what Cat Stevens was all about. He’s led a truly amazing life–with tons of controversy and praise over the last 30 years. If you have a few minutes one day, I’d encourage anyone to read about his life. Musically, he’s a great blend of folk rock mixed with a little pop from time to time, with an assortment of arrangements. You’ll hear guitar, mandolin, organ, piano and so many other instruments played by Stevens on his albums. But his signature vocal is always present, and in some ways it feels very comforting. 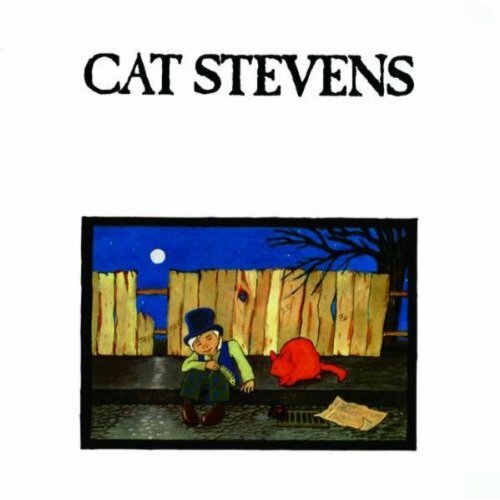 I can still remember playing an old Cat Stevens vinyl LP over and over again when I was a kid, partly because it was so different from CDs—but also because the track “Wild World” was so unique. I’m happy to pass that joy onto you all today, and for such a low price of $5 dollars. Cyber Monday—ha!—Cheap Tunes Tuesday is way better!